Luxury vehicles are vehicles that simply pamper their owners. They are machines that provide a buttery-smooth ride, a panoply of gadgets and a champagne appeal. The best luxury vehicles are the vehicles in which passengers can kick back and fall asleep because they are just that pleased. They are cars that make the driver feel like royalty every second that person spends in them. The best luxury vehicles also capture the essence of elegance in their designs. Other factors such as fuel efficiency, safety and affordability are important for luxury vehicles, as well. The 2016 Mercedes-Benz is surprisingly one of the most affordable vehicles in its class. You can own one of these models brand new for a little more than $32,000. That figure is shocking given the high-quality reputation of all Mercedes-Benz vehicles. The GLA has everything that a luxury SUV lover desires: accommodations, fuel-efficiency, power and fun. The model has a cutting-edge design that sets it apart from other Mercedes vehicles while still preserving the integrity of its legendary name. The standard model comes with a 2.0-Liter inline four-cylinder motor that puts out 208 horsepower. That model can get from 0 to 60 miles per hour in a little over seven seconds. The unit comes with a 7-inch display screen that makes navigation exciting. It also has technology such as Bluetooth and music. Consumers love the SUV for its wagon-ish virtues and the all-wheel drive features. Some of them did not fancy the unit’s small size as compared to other SUV models in its class. The Cadillac Escalade has always been a leading SUV for cargo space among other wonderful features. The cargo space specs make it one of the most spacious 2016 SUVs of them all. Escalade passengers can look forward to packing their travel gear in the 15.2 cubic feet of space that is in the rear of the third row, or the 94.2 cubic feet of space that opens up when you fold down both rows. Consumers rave about how spacious this vehicle is, but the space alone isn’t what makes it an industry leader. The Cadillac Escalade ESV is the epitome of the term “easy on the eyes.” It has maintained its majestic qualities throughout the years and still manages to make its owners feel like royalty. The model has interior features such as all leather seats, heated and folding seats, cooled seating options, a premium sound system and a reconfigurable gauge display. You can enjoy technology like Cadillac’s Cue information and media system. Furthermore, the model has a powerful V8 motor that puts out 420 horsepower. In short: the Escalade rules. The Lexus RX 350 is one of the most fuel-efficient luxury SUVs that’s not a hybrid model. You can get up to 28 miles per gallon on the highway from it while also enjoying its dazzling appeal and all the technology it provides. The precision cut of the grille is still astonishing enough to make the model one of the company’s best-selling units. Furthermore, the 2016 model is a redesign that focuses on that captivating grille and gives the entire unit a futuristic appeal. The manufacturer decided that super-sizing the grille was the best way to create a distinctive edge. The RX 350 has a 3.5-Liter V6 that puts out 295 horsepower. The motor can push the vehicle from 0-60 MPH is 7.7 seconds, which is quite impressive. Furthermore, the passengers can enjoy features such as the Mark Levinson entertainment system and the 12.3-inch display screen that provides navigation information. Consumers mostly enjoy this vehicle for its design and its comfort level. The only negative that this vehicle has is a precise steering system that amateur drivers may have a problem controlling. The Acura RDX is surprisingly one of the safest luxury SUV models in its class. It has a five-star safety rating from the NHTSA. Some of the safety features that the RDX has are features such as Adaptive Cruise Control, Vehicle Stability Assist, Lane Keeping Assist and the Blind Spot Information System. The unit also sports features such as the Tire Pressure Monitoring System and the Collision Mitigation Braking System. Safety is not the only area in which the RDX excels. Its technology includes a premium audio system and USB and iPod integration and a high-quality navigational system. Consumers were pleased with this model for its performance. Power is one of the most important aspects of a luxury SUV other than prestige. Consumers always want to have the ability to zip past other vehicles on the road. The 2016 Land Rover Range Rover is one of the most powerful luxury SUVs on the market. The model has a roaring engine that puts out more than 550 horsepower. The Range Rover demands respect, and it demands respect now. You can appreciate the Rover’s fuel efficiency, as well. The model can get up 28 miles per gallon on the highway, which is impressive for such a strong motor. Some of the exterior features that the Range Rover has are electrical towing preparation, parking aid, LED rear lights and follow-me-home lighting. The technology features are extensive on the vehicle. You can look forward to using features such as the Terrain Response system, navigation, four-wheel drive, interactive touch display and so much more. The vehicle also has more than 32 cubic feet of cargo space and 11.6 inches of obstacle clearance. You’ll spoiled by the Rover’s dedicated power controls. 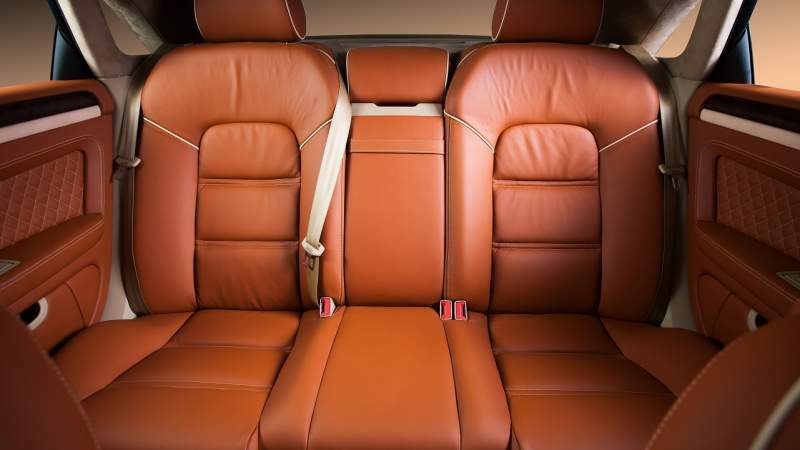 You can also enjoy the comfortable seating and experience inner-vehicle luxury at its finest. It is an all-around champion in several areas and will provide you with a high level of comfort and convenience. Buying a luxury vehicle that is a perfect match is important for long-term happiness. When you’re ready to start test driving vehicles, make sure you sift through this list of luxury SUV models again to find something that suits your personality. The goal is to choose an SUV that has a well-rounded list of positive attributes and will meet your needs for family or business. All the SUVs on this list are fine SUVs that are sure to make just about any driver happy.